Cladogram (family tree) of a biological group, showing the last common ancestor of the composite tree, which is the vertical line ‘trunk’ (stem) at the bottom, with all descendant branches shown above. The blue and red subgroups (at left and right) are clades, or monophyletic (complete) groups; each shows its common ancestor ‘stem’ at the bottom of the subgroup ‘branch’. The green subgroup is not a clade; it is a paraphyletic group, which is an incomplete clade here because it excludes the blue branch even though it has also descended from the common ancestor stem at the bottom of the green branch. The green subgroup together with the blue one forms a clade again. A clade (from Ancient Greek: κλάδος, klados, “branch”), also known as monophyletic group, is a group of organisms that consists of a common ancestor and all its lineal descendants, and represents a single “branch” on the “tree of life“. The common ancestor may be an individual, a population, a species (extinct or extant), and so on right up to a kingdom and further. Clades are nested, one in another, as each branch in turn splits into smaller branches. These splits reflect evolutionary history as populations diverged and evolved independently. Clades are termed monophyletic (Greek: “one clan”) groups. The term “clade” was coined in 1957 by the biologist Julian Huxley to refer to the result of cladogenesis, a concept Huxley borrowed from Bernhard Rensch. Many commonly named groups, rodents and insects for example, are clades because, in each case, the group consists of a common ancestor with all its descendant branches. Rodents, for example, are a branch of mammals that split off after the end of the period when the clade Dinosauria stopped being the dominant terrestrial vertebrates 66 million years ago. The original population and all its descendants are a clade. The rodent clade corresponds to the order Rodentia, and insects to the class Insecta. These clades include smaller clades, such as chipmunk or ant, each of which consists of even smaller clades. The clade “rodent” is in turn included in the mammal, vertebrate and animal clades. 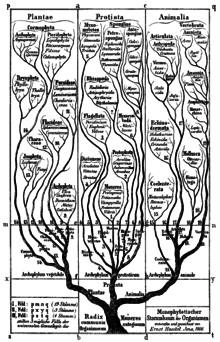 Early phylogenetic tree by Haeckel, 1866. Groups once thought to be more advanced, such as birds (“Aves”), are placed at the top. The idea of a clade did not exist in pre-Darwinian Linnaean taxonomy, which was based by necessity only on internal or external morphological similarities between organisms – although as it happens, many of the better known animal groups in Linnaeus’ original Systema Naturae (notably among the vertebrate groups) do represent clades. The phenomenon of convergent evolution is, however, responsible for many cases where there are misleading similarities in the morphology of groups that evolved from different lineages. With the increasing realization in the first half of the 19th century that species had changed and split through the ages, classification increasingly came to be seen as branches on the evolutionary tree of life. The publication of Darwin’s theory of evolution in 1859 gave this view increasing weight. Thomas Henry Huxley, an early advocate of evolutionary theory, proposed a revised taxonomy based on clades. For example, he grouped birds with reptiles, based on fossil evidence. German biologist Emil Hans Willi Hennig (1913 – 1976) is considered to be the founder of cladistics. He proposed a classification system that represented repeated branchings of the family tree, as opposed to the previous systems, which put organisms on a “ladder”, with supposedly more “advanced” organisms at the top. The science that tries to reconstruct phylogenetic trees and thus discover clades is called phylogenetics or cladistics, the latter term coined by Ernst Mayr (1965), derived from “clade”. The results of phylogenetic/cladistic analyses are tree-shaped diagrams called cladograms; they, and all their branches, are phylogenetic hypotheses. An episode of Elementary was titled “Dead Clade Walking” and dealt with a case involving a rare fossil. A semantic case has been made that the name should be “holophyletic”, but this term has not acquired widespread use. For more information, see holophyly. ^ Cracraft, Joel; Donoghue, Michael J., eds. (2004). “Introduction”. Assembling the Tree of Life. Oxford University Press. p. 1. ISBN 978-0-19-972960-9. ^ Pace, Norman R. (2006-05-18). “Time for a change”. Nature. 441 (7091): 289. Bibcode:2006Natur.441..289P. doi:10.1038/441289a. ISSN 1476-4687. PMID 16710401. ^ Dupuis, Claude (1984). “Willi Hennig’s impact on taxonomic thought”. Annual Review of Ecology and Systematics. 15: 1–24. doi:10.1146/annurev.es.15.110184.000245. ^ Huxley, J. S. (1957). “The three types of evolutionary process”. Nature. 180 (4584): 454–455. Bibcode:1957Natur.180..454H. doi:10.1038/180454a0. ^ Brower, Andrew V. Z. (2013). “Willi Hennig at 100”. Cladistics. 30 (2): 224–225. doi:10.1111/cla.12057. ^ “International Code of Phylogenetic Nomenclature. Version 4c. Chapter I. Taxa”. 2010. Retrieved 22 September 2012. ^ Envall, Mats (2008). “On the difference between mono-, holo-, and paraphyletic groups: a consistent distinction of process and pattern”. Biological Journal of the Linnean Society. 94: 217. doi:10.1111/j.1095-8312.2008.00984.x. ^ Nixon, Kevin C.; Carpenter, James M. (1 September 2000). “On the Other “Phylogenetic Systematics““. Cladistics. 16 (3): 298–318. doi:10.1111/j.1096-0031.2000.tb00285.x. ^ a b Krell, F.-T. & Cranston, P. (2004). “Which side of the tree is more basal?”. Systematic Entomology. 29 (3): 279–281. doi:10.1111/j.0307-6970.2004.00262.x. ^ Smith, Stacey (2016-09-19). “For the love of trees: The ancestors are not among us”. For the love of trees. Retrieved 2019-03-23. ^ “Choosing the Book title ‘Clade‘“. Penguin Group Australia. 2015. Retrieved 20 January 2015. DM Hillis, D Zwickl & R Gutell. “Tree of life“. An unrooted cladogram depicting around 3000 species.